Sometimes coming up with those tags is more work than perfectly framing your latest #flatlay shot. In the age of amazing image recognition tech, it must be possible to create something that can help us out and give us more time to move that light source around to cast the right shadow over your meal. In this article I’ll show you how to automatically generate image hashtags via a chatbot using Microsoft’s Computer Vision API. Now that we are making more conversational interfaces thanks to technology like botframework, interaction with the user is no longer limited to a tap on a link or a button. Having written language as the primary form of interaction with our systems gives significant difficulties in terms of intent understanding, but also gives great opportunities for further understanding of the user. Intent understanding has already been tackled by the likes of LUIS; what about the user’s sentiment? In this article I’m going to introduce Microsoft’s Text Analysis API and show you how to easily get sentiment analysis for a message coming in to your bot. There has been some significant progress in “deep learning”, AI, and image recognition over the past couple of years; Google, Microsoft, and Amazon each have their own service offering. But what is the service like? How useful is it? Everyone’s having a go at making a chatbot this year (and if you’re not, perhaps you should contact me for consultancy or training!) – and although there are some great examples out there, I’ve not seen much in the e-commerce sector worth talking about. In this article I’m going to show you a cool use case for an image recognition e-commerce chatbot via a couple of clever APIs wired together by botframework. Having a botframework chatbot up and running and responding to user messages is one thing, but how can you send a new message to bring the user back into the conversation if they haven’t just sent a new message for you to reply to? The botframework documentation and other tutorials will point you towards using Azure Functions and the new ActivityType.Trigger to handle this which, although being a great use case for Azure Functions, make the underlying implementation harder to understand. It also means you couldn’t easily implement this on AWS, for example. In this article I’ll show you how to easily implement Proactive Botframework Messaging just using BotFramework fundamentals. The past two articles have been about setting up a botframework bot in Skype and comparing the various Skype clients to see how it’s rendered. 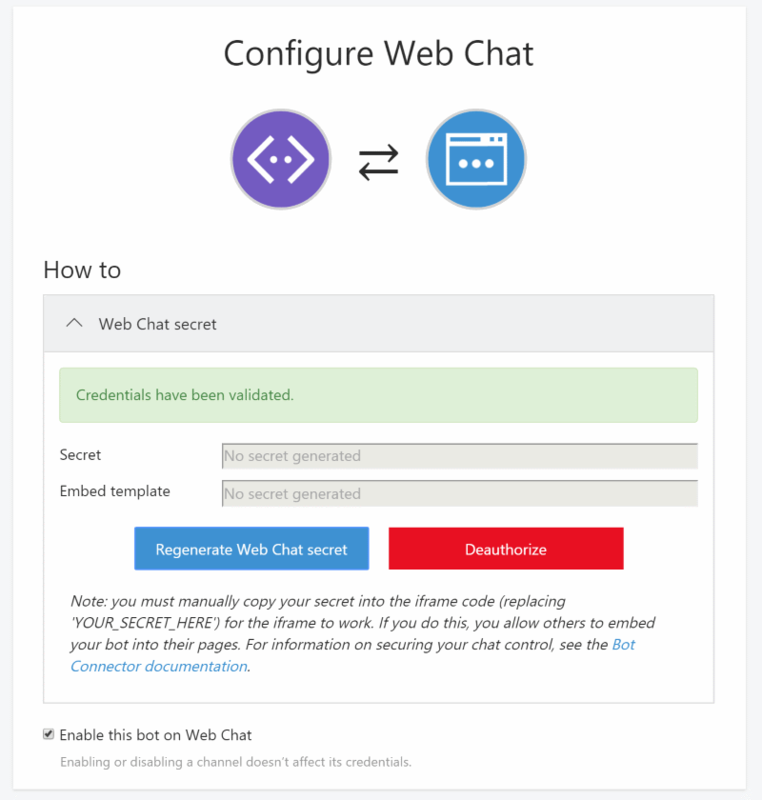 In this short article we’ll have a look at configuring the Web Chat client. In the last article about bots I covered creating a basic bot using Microsoft’s botframework, setting up Azure, deploying the bot into Azure, and configuring it to work within Skype. In this article we’re going to investigate the various response types available to us in the botframework to develop a more rich conversational experience. Luckily you’re not limited to plain text in a bot conversation; we’re able to embed images, add attachments, give headers and subheaders, add a button or link, tap events for various areas, as well as use markdown to format the main text content. 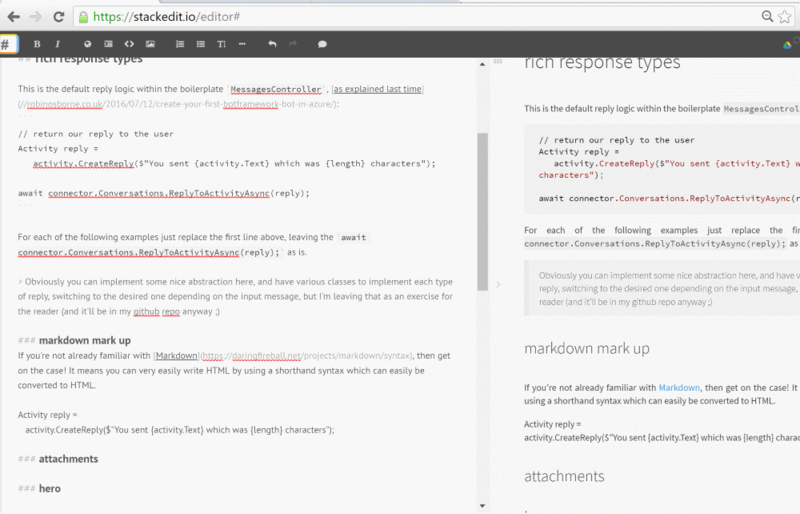 If you’re not already familiar with Markdown, then get on the case! It means you can very easily write HTML by using a shorthand syntax which can easily be converted to HTML. 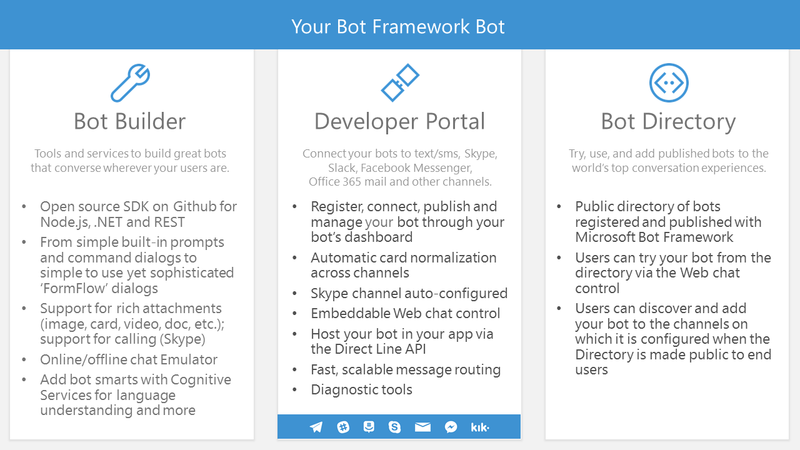 At //Build 2016 Microsoft unleashed something known as the Bot Framework; a set of three products to help you build conversational bots and connect them with services, like Slack, Skype, and even Email and SMS. Bot Builder is what you use to implement a more complex and intelligent conversational flow, optionally leveraging the awesome power of some of the Microsoft Research’s Cognitive Services for language interpretation, image recognition, and much more. In this article I’m going to take you through the process of creating, deploying, and configuring your own Skype bot. A while ago I created the most useful web page I’ve ever written; an extremely basic page to list the bus arrival times, based on your current location anywhere in London! I have used this page several times a day on an almost daily basis since I created it, as does my wife; every morning we need to know when the next bus will arrive near our house in order to know when to rush out with our children to take them to school. I used it every morning to check if I needed to rush out the door to catch the rare “express” bus that would get me to the tube much quicker than the usual one. I discovered just how useful it is whilst in a pub, deciding whether I had time for another drink before heading home; a quick glance at my phone and I could find out that the next bus home wasn’t for 20 minutes – plenty of time! However, recently it stopped working for me. It still worked just fine on my wife’s iPhone (and hence Safari), but not on my Nexus (Chrome). It works on my laptop too, or at least appeared to. At Mailcloud I am constantly destroying and rebuilding environments (intentionally! ), especially the performance test ones. I also need to gather oodles of metrics from these tests, and I have a simple script to create the VM and another to install all of the tools I need. This article will cover using a simple Powershell script to create the Linux VM and then a slightly less simple bash script to install all the goodies. It’s not as complicated as it may look, and considering you can get something running in a matter of minutes from a couple of small scripts I think it’s pretty cool! $SubscriptionName= "your azure subscription name here"
$StorageAccount = "your storage account name here"
$Location = "your location here"
# vm configuration - setting up ssh keys is better, username/pwd is easier. Change “Small” to one of the other valid instance sizes if you need to. Write-Host "now run: ssh $serviceName.cloudapp.net -p $SSHPort -l $user"
Now we have a shiny new VM running up in Azure, so let’s configure it for gathering metrics using a bash script. You could probably have the powershell script automatically upload and execute this, but it’s no big deal to SSH in, “sudo nano/vi” a new file, paste it in, chmod, and execute the below. echo "#### apt-get updating and installing prereqs"
Here I’ve configured it to use mongo-statsd-backend as the only backend and not graphite. Configuring Graphite is a PAIN as you have to set up python and a web server and deal with all the permissions, etc. Gah. You could use npm to install mongo-statsd-backend, but that version has a few pending pull requests to patch a couple of issues that mean it doesn’t work out of the box. As such, I use my own patched version and install from source. Fancy getting ElasticSearch in there too? To pull down and install the java runtime, install ES and the es-head, kopf, and bigdesk plugins, add the below script just before you kick off the “screen” command. You can now browse to /_plugin/bigdesk (or the others) on the public $ElasticSearchPort port you configured in the powershell script to see your various ES web interfaces. The whole script is in a gist here. I use StatsD to calculate a few bits of info around the processing of common tasks, in order to find those with max figures that are several standard deviations away from the average and highlight them as possible areas of concern. I have an Azure Worker Role to pull azure diagnostics from table and blob storage and spew it into the Elasticsearch instance for easier searching; still figuring out how to get it looking pretty in a Grafana instance though – I’ll get there eventually. The magic is in Set-AzureStorageBlobContent. Don’t forget to do the usual dance of calling the following! Actually, the Aug 2014 version of Azure Storage Explorer already sets the content type correctly upon upload. Oh well. Still a handy automation script though!